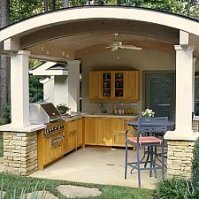 Can A Big Green Egg Complete Your Outdoor Kitchen? Huh? First, some clarity. No - the Big Green Egg is not a Dr. Seuss book. It's a charcoal grill. A very, very nice charcoal grill. So where does the name come from? Well, they didn't consult with me, but I'm fairly certain it has something to do with the general appearance of the grill. You think? Now, after you're through laughing at the name and the appearance of this charcoal grill, let's take a closer look. I think you'll be impressed. Actually, this is more than just a charcoal grill. It's also a smoker - an oven - and a grill, all in one. So there is no need for separate pieces - this piece does it all. You can grill your steak and bake your bread with this cooker. 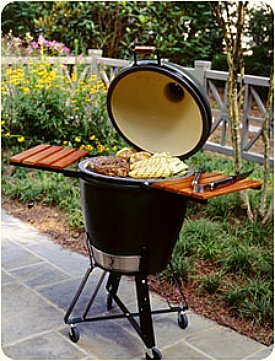 This style of grill derives its design from an ancient clay cooker called a "kamado". This modern version is made of ceramic and is packed with unique features. 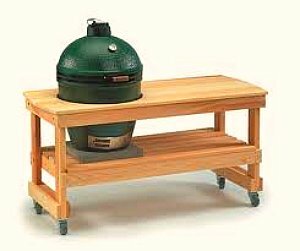 What's So Special About The Big Green Egg? Ready to cook in 10 minutes - no lighter fluid needed! That's a pretty impressive list, but the real question is - how well does it cook? That's the most impressive feature of the Big Green Egg. As a smoker, the precise temperature controls produce superior results with turkey, lamb, ham, chicken, ribs - really any barbecued meat. As an oven it bakes bread, biscuits, cakes, cookies, pizzas, and even pies. I'm sure you've done that in your traditional charcoal grill, right? When used as a grill, you can sear steaks, burgers, pork chops, fish and other seafood, sealing in the flavor like no other grill can. It is capable of grilling at temperatures up to 750 degrees! Vegetables are a breeze - corn, potatoes, mushrooms, asparagus, onions, peppers, squash - whatever your taste, you can handle it with ease. This isn't something new. The Big Green Egg was introduced in 1974, so after nearly 40 years you can depend on them to stand behind their product. Every cooker comes with an impressive list of included items. The lid is hinged for easy one hand opening and closing. A stainless steel draft door makes air adjustment a snap. 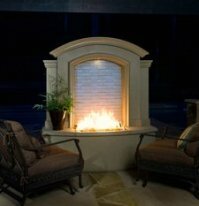 Cushioned gaskets provide improved insulation and sealing. The heavy cooking grids are porcelain coated for easy cleaning. The dampers control the temperature very precisely to within a few degrees. An external temperature gauge gives you accurate readings at a glance. And don't worry about getting in over your head - every model comes with a written manual as well as an instructional CD / DVD. There are five sizes to accommodate whatever your needs are. From the 9.5 inch "mini" to the 24 inch XLarge, you're sure to find the size you need. If you are serious about your outdoor cooking (or if you're ready to get serious) take a close look at the Big Green Egg. Sure, you'll pay a little more, but you'll never regret it. After your first cookout, it will be worth every penny! In the central North Carolina area, give The Grill Doctor a call at 704-799-6429 or online at www.thegrillmedic.com. They are a great bunch of folks and they really know their stuff. 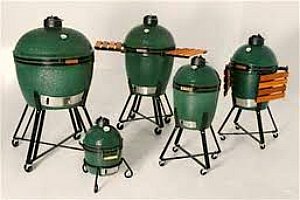 They can help you with your Big Green Egg purchase as well as with a huge assortment of other grills and cookers. They have a fantastic showroom and will be happy to help you make a decision that's best for you. 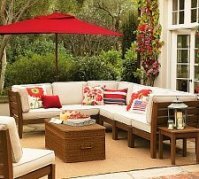 Tell them Mike from Backyard Design Ideas sent you!